Christening Ceremony for 40D airship will take place in Tustin, California next week. Southern California residents will soon be gazing skyward as a captivating aviation giant take to the skies. Inflation is now complete on a new airship that will be flying locally after first taking shape last week at a Southern California hangar in Orange County. The vehicle’s envelope (S/N A40D-22) is now filled with more than 100,000 cubic feet of Helium, helping ready the 150 foot plus vehicle for test flights in Tustin prior to its international service deployment for multi-role operations overseas beginning this fall. The 40D ‘Sky Dragon’ airship will be christened next Friday, September 12th at 1:30 PM/PT during a dedication ceremony in Tustin with elected officials and other VIPs expected in attendance. Media interested in b-roll of this aviation giant, attending the dedication, or scheduling pilot interviews/flight footage should contact Aeros PR (below) for segment planning assistance. As a sensor platform, the airship maintains extended time on station and low operational costs supporting a variety of surveillance missions from anti-terrorism to smuggling interdiction. The vehicle’s 24-hour imaging capability, loiter duration, 360 degree field of view, HD downlink and remote camera operation capabilities together support mission success and efficiency, as well as flexibility to cover more ground with less manpower requirements. The system will speed detection and identification abilities, facilitate documentation, and support response command and control for a variety of missions. 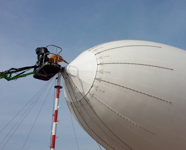 About Aeros: Founded 27 years ago in the U.S., the Aeroscraft Corporation (Aeros) has grown from a small aerostat production manufacturer to a leading FAA-certified airship producer and R&D firm for the aerospace industry. Aeros has achieved multiple FAA airship type certificates and operates with an FAA Production Certificate, while featuring a product line that includes advanced airships and tethered aerostats utilized in commercial and government applications throughout the world. Aeros is also the innovator of the Aeroscraft cargo airship solution, a new type of rigid, variable-buoyancy air vehicle designed to control lift in all stages of air or ground operations, including the ability to off-load heavy payloads without the need to re-ballast. Learn more at http://www.aeroscraft.com.